If we bear more than one smart devices, the necessity of exchanging data increases. PushBullet is the most widely used service for Android users to send content between their devices and Google Chrome, there are some more interesting services as well. Message Beam is one of them. Message Beam is a free Android app developed by XDA member d-fader, that works with the Chrome extension parallel in order to quickly exchange text information or URLs between your computer and phone or tablet. Then you can easily copy that information to your clipboard in a snapshot. Beams are transmitted via the internet through an XMPP server. allowing you to remotely access your beams. Now a brief description of how it works. Firstly you have to download and install the app in your device, open and tap ‘Menu’ and click on ‘Link new device’. Note down the ‘link ID’ shown in the proceeding screen. 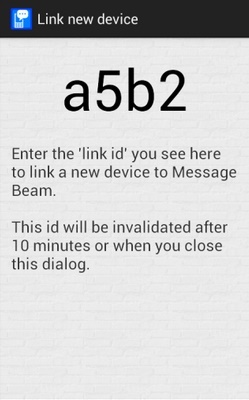 The link ID is usually an alphanumeric code and is unique to each device you want to link to Message Beam. This protects your data from unauthorized use. After this install the Chrome extension and click it’s Omnibar icon, and then ‘Options’. This application helps to link a number of devices but for the first time you have to register to every device by following the steps you will come across.